The University of Arizona Wildcat's battle cry of Bear Down and fight song (hear it here) comes from the Thursday October 18, 1926 final dying words of a 22 year old wildly popular charismatic student leader, and multi talented athlete who often trained in what was then the newly built Men's Gymnasium as the Bear Down Gym was originally named. In 1925 John 'Button' Byrd Salmon was the President of the Student Body, the varsity football teams starting quarterback and team captain, and a three-year star catcher for the baseball team with obvious major league potential. Nicknamed 'Button' by his family for his small frame (5'8", 145 pounds) and unbelievably impish good looks, he was extremely popular with his teammates, coach, fellow students, the people of Tucson, all the schools girls, and many of the young girls around town. John's father, Frank Salmon was born in 1875 and raised in Texas. Frank, was an educated smart tough no nonsense but always very supportive family man who worked hard in management for the Phelps Dodge Copper Corporation in Bisbee during the Deportation of 1917, his mother Kathryn E. (Simpson) Salmon was a gentle yet tough fine lady and very loving mother born in New Orleans, Louisiana in 1878. Eventually, both parents were buried in Tucson near the son they loved so much. Their son, John 'Button' Byrd Salmon was born in Christoval Texas on October 22, 1903 and grew up with his parents in the tough early 1900's copper mining town of Bisbee, Arizona. 'Button's' older brother Riney B. Salmon was also very athletic, and mentored-supported his young brother John 'Button' Byrd Salmon in both baseball and football at Bisbee's Warren Ballpark where the Young 'Button' Salmon regularly played baseball with the likes of numerous members of the Chicago White Socks, and many other pro ball players of the time who spent time there in the off season. 'Button's" brother Riney B. Salmon later became the President of the Arizona-Texas Baseball League from 1948 to 1950. 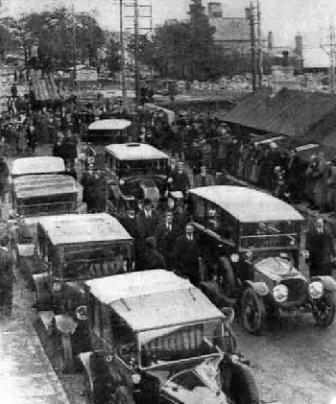 The very day after the 1926 season's big opening football game, John 'Button' Byrd Salmon was driving at a very high rate of speed coming back from Phoenix in his Ford Model T (see article) (see video) with a football-fraternity buddy and a young girl when he missed a treacherous curve and hit the dirt berm along the side of the road near Picacho Peak, Arizona. His car overturned numerous times , and crashed down into a deep ravine pinning him underneath the wreckage for hours until any help arrived. The other two passengers were both ejected from the car miraculously sustaining only a few deep lacerations, cuts and bruises, but they were not seriously injured. However, young John 'Button' Byrd Salmon was not so lucky and suffered a severed spinal cord injury leaving him paralyzed from the neck down. Dr. Victor Melsor, a well respected and extremely talented Tucson surgeon, performed the 8 hour surgery on 'Button' at the Southern Methodist Hospital in Tucson, but the spinal injury was just too severe. John 'Button' Byrd Salmon died 14 days later on October 18, 1926, at Southern Methodist Hospital in Tucson. On the day of October 18, 1926 'Button' gave a final message to his coach and ultimately to his football and baseball teammates. John 'Button' Salmon's coach 'Pop' Mc Kale, who had been visiting 'Button' Salmon every single day for 13 days at the hospital, was talking to 'Button' when the injured young man whispered 'Pop' come closer....."Tell them...Tell The Team To Bear Down. The Nurse in attendance then noted that John ' Button' Salmon breathed in one last breath and died peacefully at 10:32 am. On the day of his funeral all classes at the UofA and all over Tucson were cancelled for the day. Employers and employees city wide left their jobs to attend John 'Button' Byrd Salmon's funeral service which was held on the University of Arizona's campus at the auditorium. Afterwards, the well over three-mile long line of Ford Model T's, Model A's, citizens on horseback and driving horse drawn wagons, every taxi in town that was running, and various other cars of the era slowly made their way from the University of Arizona through downtown Tucson and up to the Evergreen Cemetery north out of town to the cemetery off Oracle Rd. Late the night of October 18, 1926 after 'Pop' had returned from the hospital he was working at his office desk in Bear Down Gym around 10pm that night. It was revealed only later that the ghost of John 'Button' Byrd Salmon wearing his football jersey appeared to him at the doorway to the office and began walking toward the exhausted coach. The apparition uttered only two words, "Bear Down." Other employees, janitor's, and students in the gym both during the day and especially late at night have reported over the years since 1926 their encountering the apparition of a short young man in a well used 1920's era football jersey moving throughout various areas of the gym. Constructed in 1926 to replace Herring Hall, and named after Colonel Herring, which was the university's original gymnasium, Bear Down Gym is a two story brick structure noted for its curved roof, large semicircular terra cotta entrance and deeply recessed entry with copper-clad window frames. The building is topped with a slightly projecting cornice that includes terra cotta detailing. The exposed bow-truss roofing system is a notable interior feature. Originally, the main level provided basketball courts and room for gymnastics, while the lower level contained locker rooms, offices, and space for the Department of Military Science and Tactics. The building at one time seated about 6,000 spectators and was used for sports, school dances, and the annual student registration activities. 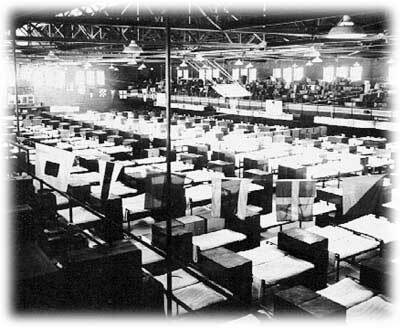 Quickly after December 7, 1941 with the outbreak of World War II, Bear Down Gym (and many other facilities at the U of A) were taken over by the U.S. War Department as a barracks for 500 young students at a time as they went through their "Expedited" Naval Indoctrination School, just prior to being shipped off to war. Many of the 'green' sailors and officers who lived and trained there together 24/7 gave their lives in the war effort and never returned. It's said that their ghosts still frequent Bear Down Gym looking to start where they left off back when they were young students.